Like all natural products, Manuka honey varies in quality according to its origin and other factors. That’s especially important to keep in mind when you’re buying the honey for its bioactive compounds, such as methylglyoxal, because some Manukas actually contain very little of these. When you buy Manuka Health honey, though, you can be sure of the methylglyoxal content, because it’s written right on the label. 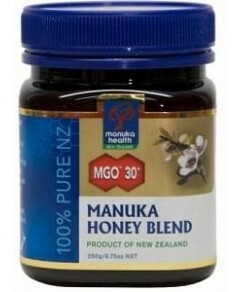 Manuka Health performs a laboratory analysis of all honey it harvests, then bottles them according to their methylglyoxal strength, which is indicated by the proprietary MGO rating. That makes it simple to pick the potency and price you want. This MGO 100+ honey has at least 100mg/kg of methylglyoxal, which is considered the minimum effective level. It’s an entry-level Manuka that gives you most of the bioactivity benefits but won’t break your budget.